Maschinenfabrik Gustav Eirich, Hardheim, Germany, reports that permanent-magnet synchronous motors – also known as torque or high-torque motors – are rapidly becoming established as the standard solution for more and more applications – and now also in mixing technology. 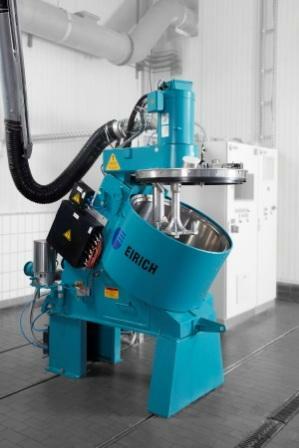 Combined with a compact design that only requires very little installation space, the high torque output of these drives now enables Eirich to provide its customers with energy-efficient solutions for challenging mixing tasks. According to the company, mixing drives with asynchronous motors – which have been widely used for many years – come with restrictions. Usually, the rotational speed of the motor is not the same as that of the mixing tool. In order to obtain the most suitable mixing speed for the mixing task, gearing ratios are normally achieved with the aid of V-belt drives, or gearboxes are used for applications with a high torque demand to translate high motor speeds into low tool speeds. The use of torque motors offers many advantages: less weight, more power and minimised losses improve efficiency and dynamic performance. Thanks to the omission of a number of mechanical elements, torque motors are low-noise and low-maintenance. Vibrations are also reduced and the motor runs more smoothly.